While various media streaming devices (Roku, Boxee, etc.) 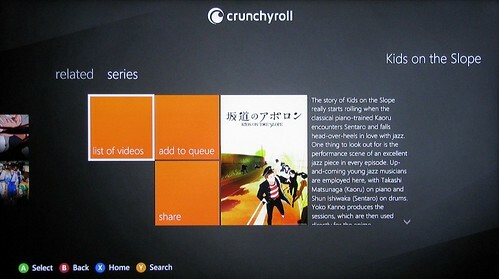 and adapters have been enabling web-based content to be viewed via home theater systems for a little while now, and the PlayStation 3 got its Crunchyroll app back in July of 2012, Xbox enthusiasts have been left wanting ... until now. 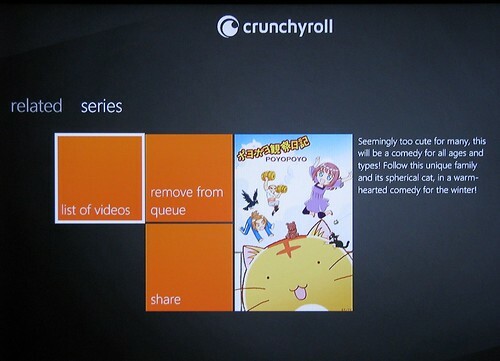 Behold that which will erase sunlight from memory and turn every waking hour into Saturday morning: the Crunchyroll Xbox 360 app. 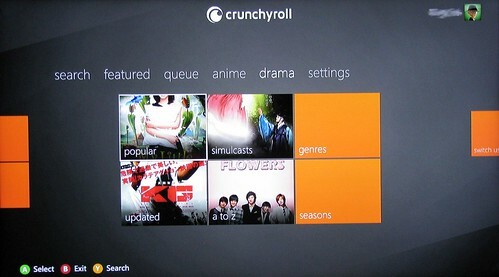 There are no sections for News, Forums, or the Store; this app’s strictly for watching your favorite shows almost exactly as one would on the Crunchyroll website ... except on a WAY larger screen, in beautiful stutter-free HD, and with the ability to switch over to leverage all that the Xbox is capable of without leaving the comfy chair. Viva Otaku! 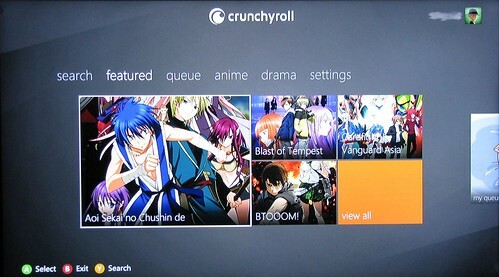 After signing into an Xbox Live Gold account and logging into the CR app with a Premium Member account (or a temporary account via the free trial offer), users gain access to all of the same options they’re used to on the CR website: a basic search, featured titles, a personal queue, as well as anime and drama categories with selections galore. The main Search function is the typical one for an Xbox app, where the alphabet is sprawled out across the top of the screen and tiles representing titles that correspond to keypunches appear below. It’s the same degree of clunky as any Xbox app-based search, but it gets the job done. Paralleling the Popular section on CR’s website, the Featured category offers a few panels of highlighted shows and a View All option for further random browsing. If you see some promo artwork that catches your eye, hit A to see a summary and episode list option or just dive right in! It’s all anime and drama, so it’s all good, right? For shows CR members want to keep track of, their synched CR Queue is ready and waiting. Shows can be added and deleted at the press of a button, and the History option displays the last 20 shows watched for quick reference. App-based options for browsing Anime and Drama are the same as on CR: Popular, Updated, Simulcasts, Alphabetical, Genres, and Seasons. Whatever way you browse, panels displaying series artwork are tiled for perusal. 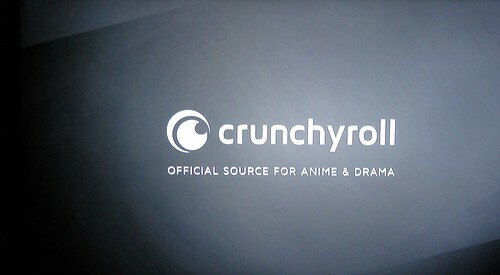 They lack the pop-up descriptions of CR’s website, but those are revealed once a particular show is selected. The search function comes to be a bit of a hindrance here. Since there is no easy jump-to letter selection function, users must scroll through choices by tapping or holding a bumper button or leaning steadfast upon the right analog stick. Switching between genres is also a bit counter-intuitive. Whereas the app has the equivalent of a Sort By button, re-clicking it to select another genre instead brings users back out to a stripped-down version of the main Anime menu instead of the genre list. “Related” suggestions are also offered for each specific series accessed, and a Share button lets users who have chosen to link their Facebook accounts post about what show they’re watching or about to watch and how they’re gonna do it (via the CR Xbox 360 app!). Spread the love. Why wouldn’t you? For that matter, why isn’t the “I’m watching this” posting option more integrated with the Xbox messaging system? As a regular, app-usin’, anime-watchin’ joe, I can say that this long-awaited and mostly intuitive app is my new best friend. 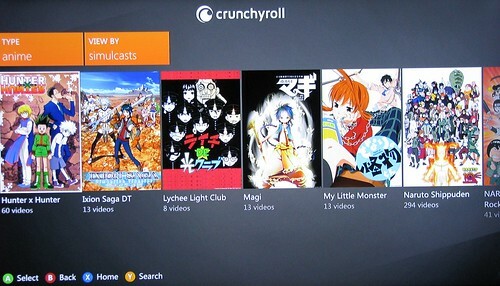 After the enjoyment of finally being able to browse through the entirety of Crunchyroll’s immense catalog (10,000+ hours) and choosing a show or several to watch, what’s the experience like? Sublime. Larger than life (or at least more so than a computer monitor) and in beautiful HD. Accessing video controls is as easy as any other video app, and for those who love marathoning shows, sequential episodes roll immediately and seamlessly. I do not have a Kinect, so I cannot speak to how awesome it must be to say “Xbox, get me my waifu” and immediately start watching Natsuyuki Rendezvous. I know not the cathartic joy that would come from the ability to select the moé genre and flip through panels while pretending to slap some sense into the likes of the Kanon cast. But as a regular, app-usin’, anime-watchin’ joe, I can say that this long-awaited and mostly intuitive app is my new best friend. Now, when will FUNimation take the hint? DISCLAIMER: Ani-Gamers partners with Crunchyroll News (the administratively separate news blog on Crunchyroll's website) to cross-post our content. Rest assured that this DOES NOT influence our reviews of Crunchyroll series or — in this case — apps. This review is based on an app downloaded by the reviewer. As contributing editor here at Ani-Gamers, Ink contributes his own pieces and edits others' pertaining to anime and games. He was also responsible for the Drunken Otaku column and currently produces the Three-Episode Test column. Occasionally his reviews and analyses appear in the pages of Otaku USA as well as online over at The Fandom Post. Follow his ramblings on animation via his Twitter feed, or follow his more poetic and political tweets via his other Twitter feed. As always, all opinions are his own and do not represent the opinions or interests of Otaku USA.